Madison Environmental Resourcing Inc. - MERI Inc.
affordably dispose your infectious waste. 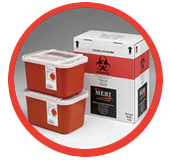 Medical Waste Disposal in WI, IA, IL, MN, MI UP – MERI Inc.
A partnership of three Madison, WI hospitals, MERI Inc. helps facilities throughout the Midwest properly dispose medical waste including sharps, infectious, hazardous, pharmaceutical, universal and blue wrap. MERI looks out for my hospital’s best interest. I like doing business with MERI because they are honest and trustworthy. I would recommend MERI to any healthcare facility, with their friendly and helpful staff who are always available for suggestions on how to save money and make processes easier. MERI’s customer service is second to none as they are flexible with pick-up times to best suit the facility scheduling. If we have questions MERI’s staff is more than willing to help where possible.